I had a book all picked out to review this month. It was a good, solid book, and I felt fine recommending it. Then Child #4, my reluctant reader and 9th grader, told me about her weekend English homework. She had to respond with five written sentences to a prompt for every 20 pages read of her free-choice book. Cause that wouldn't kill a book for any reader! (another discussion for another time) Anyway, she chose to respond to the prompt: Would your parents like this book? Why or why not? And she wrote that her mother would love MARCELO IN THE REAL WORLD because it's about an underdog teenager with autism and because it would remind her of WONDER. Naturally, I abandoned my chores and sat down immediately to begin reading MARCELO IN THE REAL WORLD. I read the ENTIRE book. All 312 wonderful pages. And, believe me when I say I had buckets of things on my to-do list. Buckets of things that got ignored. But, oh well. When a book grabs you, everything else goes out the window, right? In a nutshell: Autistic-like 17 year-old Marcelo is safe and comfortable at his special needs school. Determined that Marcelo learn to function in the real world, Marcelo's father forces his son to work in his law office's mail room for the summer. What I loved: It's fascinating to watch Marcelo navigate the real (?) world of the law office and figure out who is friend versus who is foe. The plot is very, very clever. I'm sure by the end, Marcelo's father is sorry he forced his son to work at his law firm. Ha! The characters are fleshed out and feel real. What was a little meh: I could've done with less religion. Marcelo is really into religion and confides in a rabbi when trying to decide how to handle sensitive info he comes across at the law office. At times, I felt preached at. Although I'm particularly sensitive to that, and other readers may not feel the same way. 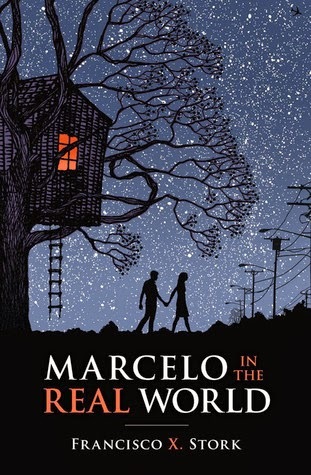 However, I heartily, heartily recommend MARCELO IN THE REAL WORLD. Heartily! Dear FCC: I borrowed this book from the library. I know neither the author, Francisco X. Stork, nor his editor, Cheryl Klein. But I'd drop everything in a heartbeat if either one wanted to meet me for coffee.